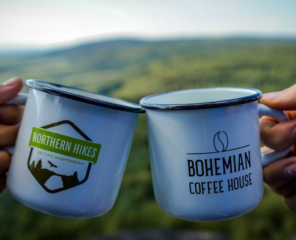 It’s hard to say what the most epic season of to be found in Bohemian Switzerland would be. Colorful autumns and stunningly white winters to bright springs and lively summers – we aren’t sure there is a wrong time to visit. 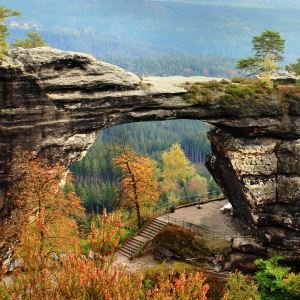 Bohemian Switzerland national park is something to be experienced, easily one of the best day trips from Prague. 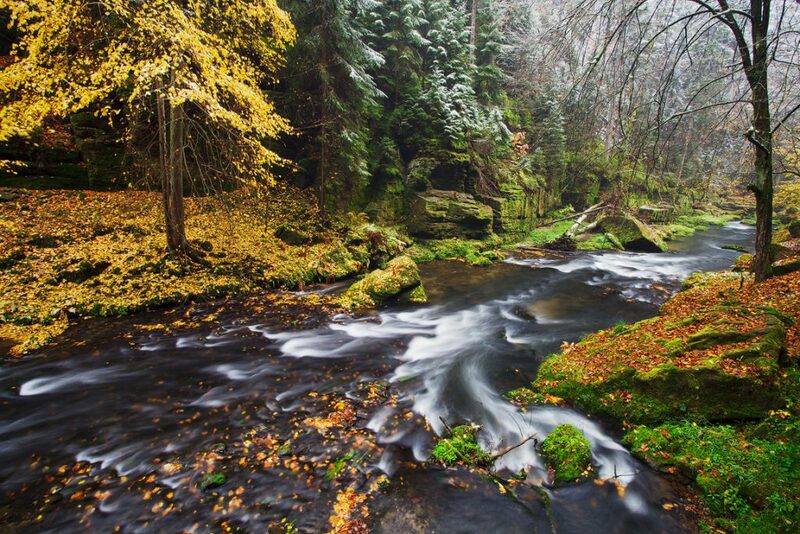 Perhaps there is nothing more truly Czech, or Bohemian, than experiencing how they embrace each season in all it’s beauty and versatilely by enjoying the stunning landscapes found within its’ borders. 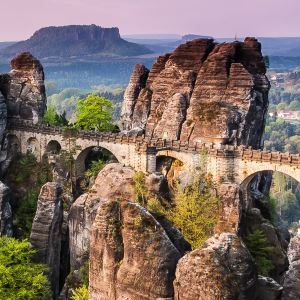 One of the most iconic is the natural wonder that straddles the border of northern Czech Republic and southern Germany made up giant sandstones, the Labe river, slot canyons and rolling landscapes that are entirely Bohemian. 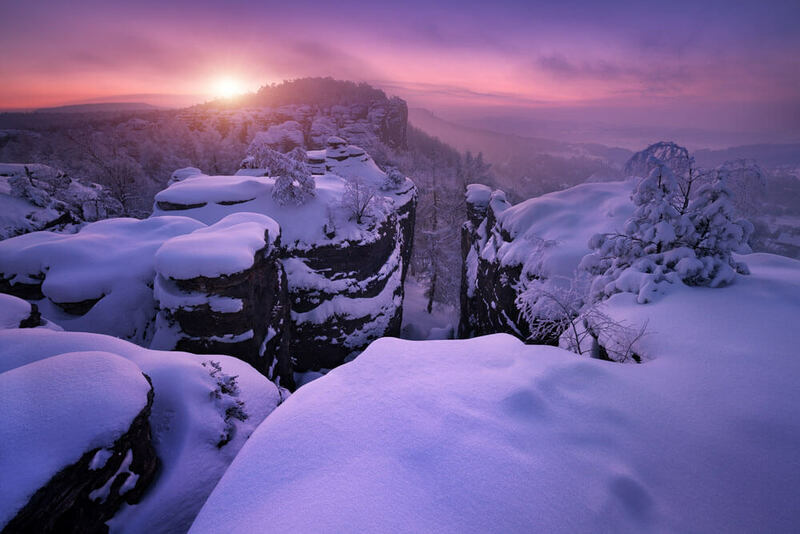 While jury is out on which season is the best, we can rest easy knowing that no matter what time of the year, Bohemian Switzerland national park will always provide an incredible experience. As our summer comes to a close we look forward to the next autumn season. Perhaps it’s the site of the colorful leaves or that fact that this time of change is fleeting, but the signalling of the yearly arrival of shorter days, fresh air and extra cups of hot chocolate never gets old. 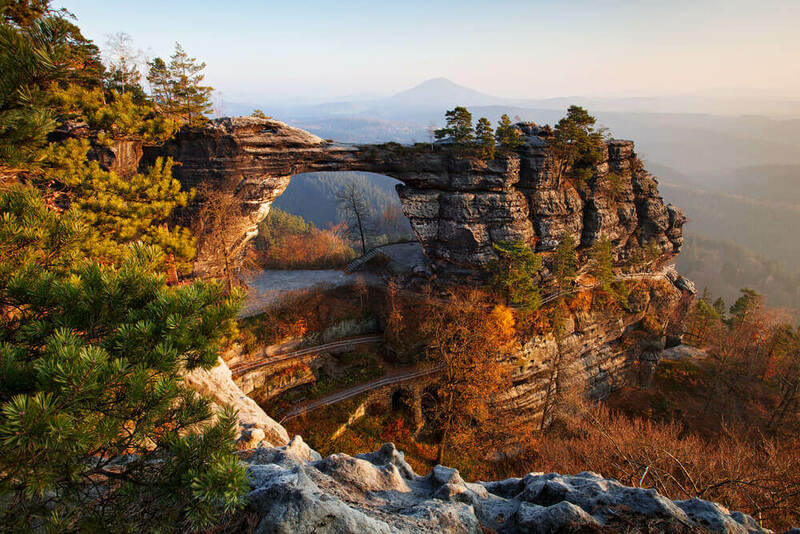 We could wander through the labyrinth of sandstones and under colorful tree canopies to the Pravcicka Gate and admire the idyllic autumn scenery in the valleys below and soak in the landscapes. Somehow, every October, we are never left as anything but awestruck, no matter how many times we witness this natural phenomenon happening everywhere. What is it about the leaves that create a collage of reds, oranges and yellows that is so enchanting? 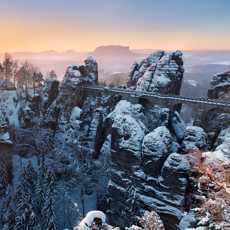 Winter is an unexpectedly incredible time to be in Bohemian Switzerland. Shorter days and colder temperatures doesn’t stop us from soaking up as much of scenery as we can. There is something special about freshly fallen snow and the winter sun that peeks through the naked trees that transforms the landscape into a complete departure from the other three seasons. 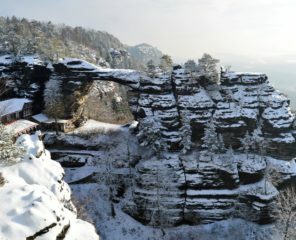 It truly is the epitome of a magical winter wonderland, and we aren’t just biased, wandering through the sandstone cliffs with snow lingering on edges leaves you feeling like you have stepped into Narnia. There is a reason for that, as part of the park has served as set locations for a few iconic scenes in the movie, & your guide in the Narnia Labyrinth will point out the spots. Aside from that, there is something special about stomping through the snow, in and out of towering sandstone formations that create slot-like canyons and make you feel small. Not to mention, the deafening silence that a good caking of snow stuck to the forest floor creates is the ideal atmosphere for a winter hike. Something about the arrival of spring seems to bring new hope in life. Almost overnight the flora and fauna seem to awake from the dead and contrast with the lifeless winter that has us excited for more sunshine, warmth, summer hikes and beyond. 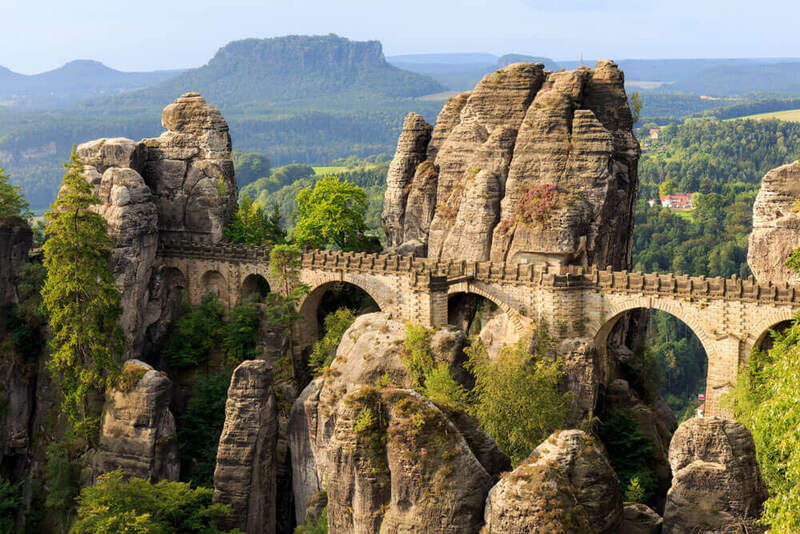 A perfect time to get out and explore the Czech nature and see the transformation happening from a bird’s perspective at the always-picturesque Bastei on the Saxon side. 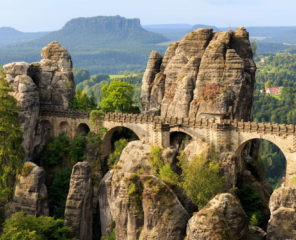 Look down from a-top the sandstone formations into the valley below as the Labe (or Elbe) River snakes through the freshly-green again forests and see why the Czech Republic is about so much more than dramatic castles and pork. Summer has come and while we embrace the warmth, sometimes escaping the harsh mid-day heat is just what we need. 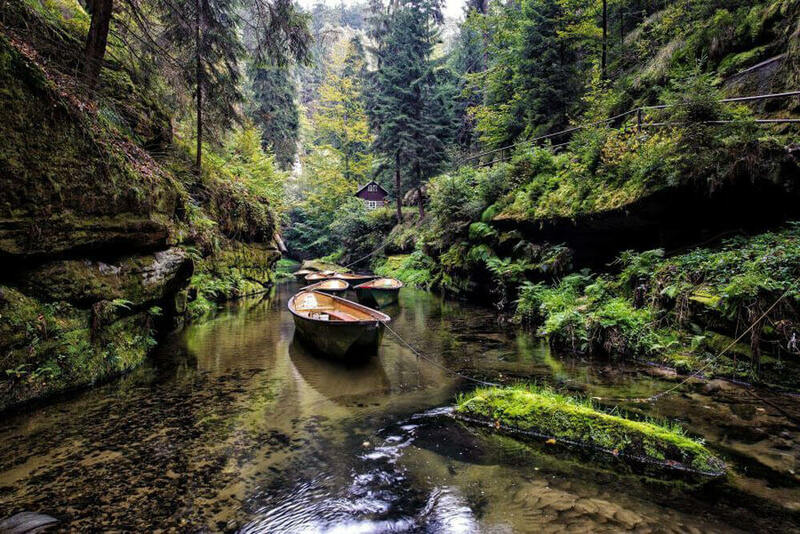 Journeying through the Kamenice gorge, a river that runs through the steep cliffs and only reachable on boat creates a cool, shady climate. Hop on a boat with a local guide and admire the trees that found roots in the porous sandstone rock. There is something enchanting about floating through the valley with lush green plastered to every surface and the calm silence that leaves you feeling refreshed and tranquil as ever.